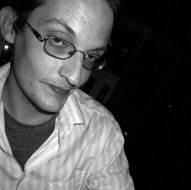 Devin Walsh earned an MFA in Playwriting from Adelphi University. His plays have been produced in San Francisco and Asheville. His short stories and poems have appeared in Swamp, Pindledyboz, Switchback, and Edifice Wrecked. He lives in Long Island with his wife and two cats. It was a clear winter's day on one of the world's beaches when an old turtle happened on a fellow traveler who had a boot on his head. The boot, which could have once seen combat, was waterworn, laceless, bleached of color by the sea. The afflicted turtle perched stock-still looking, if he could look, out over the waters, the boot and its tongue forming a tilted, backwards F. The wandering turtle, whose name was Cameron, diplomatically cleared his throat. “Damned boot on my head,” came the response, and though muffled within the ragged leather and ossified tongue of the obstructing article, the voice struck a chord of familiarity in Cameron. He knew, in an inarticulate wave of sensation, that a long lost fragment of his past had met him here, at some otherwise anonymous intersection of tide and earth, under the cold descending sun and in the audience of none but fate, whose calendar all animals of the planet kept. The blinded turtle obliged, the boot flagged to the fine sand of the beach and Cameron waddled onto the hardened footwear, his old frame responding pleasantly to the challenge. “Now back up,” he said, once firmly on the boot. “How could anyone?” Cameron agreed. A freighted moment here punctuated their reunion, and Eugene Street, who ages ago had fallen swiftly but retrievably under the spell of Cameron's sister, Mabel von Pellier—that fateful moment, at least on Gene's side, a first-sight variety of love occasioned at a pool of fresh water under a tree somewhere in Peru—brought his neck out to brush cheeks with his old friend. Eugene chewed on this tragedy and broke his gaze from Cameron to stare ruminatively at the tumbling breaks of the beach. They had all suffered, of course. “Do you still write?” he asked after an appropriate interval. Cameron nodded, sighed and came astride his friend to join the meditative watch. “I've been writing a poem,” he heaved, caught by unexpected complexes of emotion in his throat. It felt good to say. He hadn't spoken a word since the last time he'd cried Doris's name into the briny din. When he slept, even still, the pitch and clap and gut-churning yaw of that terrible night stormed through the belly of his dreams. Cameron looked peripherally at Eugene, a slanting aside of begrudging humor. The sun disappeared into the ocean. When they were young, in a solemn and lovely ceremony, Gene and Cameron had respectively married Mabel and Doris. The courtships on both sides had been difficult and long but otherwise entirely distinct. Gene Street aspired to cut a cosmopolitan figure back then: a dashing, urbane young turtle with a sophisticated palate and great dancing moves. But his ambitions were outsized and unattainable for one so lowborn. Though he really could dance a little, he had a nerve-wracking tendency to end up high in trees after bad storms, always made colossally stupid bets he never won, couldn't cook worth a damn, and never felt an unsuperlative feeling. It was these mosts and biggests and worsts that finally pierced Mabel von Pellier's reluctant heart and won it for him: she simply could not—no one could—resist indefinitely Gene Street's tireless charge. The von Pelliers were of noble stock: a distant ancestor, Otto, had been the first turtle to traverse the Pacific Ocean, and his litter had gone on to distinguish themselves in the variegated worlds of turtledom. Mabel and Cameron's grandmother, Tu'i, had been gifted, quite famously, to a Polynesian royal family by a British explorer of some renown, and lived to 188. It was there, in the Tongan archipelago, that the contemporary clutches of von Pelliers migrated indomitably throughout the trade currents, bestowing on every locale they visited a rich perfume of privilege and history. That the long tides of her life brought Mabel, alongside her brother, to the same Peruvian pond where slurped young Eugene Street, a turtle without portfolio, whose carapace bore no distinguishing marks and whose carriage was lifted by no pedigree but the force of his enthusiasm and self-importance alone, was a mystery well worth a lifetime's unraveling. Alas, not everyone has the better part of two centuries to get to the bottom of things. For his part, Cameron was a brooding sort, prone, as he presently discovered he still was, to alternating bouts of deathly silence and plangent pontification. He did not wear comfortably the mantle of greatness bequeathed him by the myriad preceding von Pelliers. He rebelled with full shell against expectations. He wished to commune, mostly, with other laconic turtles whose quiet he could freely misdiagnose as reverence. And he spent nearly all his time cornered ineluctably within the strictures of stanzaic verse spun, as if from an inexhaustible loom, in his mind. He was a poet. The truth was Doris didn't care for his poetry. He could almost finally admit this now in the soft blue clarity of afternoon—this annihilating truth that for so long had been given its license to torment him only amid the colorless shrouds of night and nightmare; an insidious, diurnal truth. But it hadn't mattered whether Doris was a fan of his poetry or not, for his poetry was a great fan of Doris. She smelled odd and stuttered and Cameron loved her completely for reasons beyond his understanding. What slakes you, thirsty ocean, more? Or the sad flotilla of mother's dears? Why he loved her he could not say, but he did, and if he'd ventured a guess early on in their marriage, it would've centered on how of every twelve months of the year, she spent eight to ten sitting on eggs while he plunged daily into whatever depths surrounded them, searching out new fodder for his next verse amid the submerged world: translucent flora drawn in the invisible breeze of deep current, lambent cities of moss, multifarious coils of reef and the impossibly busy underwater civilizations of marine life. While Doris sat on eggs, Cameron teased epics from seafloor sand that'd lain undisturbed for millennia. Once, he even met Levi. At first he'd believed it a mountain, and then the mountain had breathed, and he'd realized in a suffocating terror of revelation what it was. He spent the next five full days limning a fraction of Levi's slumbering form, finally ascending to the great beast's apex. Here could be barely discerned, amid the awesome tumble of flesh that was time itself and from the cavernous valleys of its wrinkles that were time's wrinkles and fate's and all of Earth's, Levi's closed eye. Cameron supposed he could have stayed there forever, and fancied that the fount of his tears, blasted loose by a sight so unthinkable, so majestic, would spring a new ocean. And the world would drown. He didn't know how long he stayed there, floating, vaguely ambulant, next to the first creature, but with a quick suddenness one day he was overmastered by a need to go home to Doris. It was night on the surface and baleful masses of clouds congregated on the horizon. Though his sense of direction had been obliterated by Levi's immensity, a strange, unerring compass directed Cameron home, where Doris waited on the shore, fear shining her eyes. Doris, he'd said, Doris, you're not gonna believe it! Then a tremendous wave overtook them and they were out to sea. He was dimly aware of scores of his own children, too tiny to travel, cast willy-nilly on the black waves and taken perfunctorily under. He was primarily focused on Doris, remarkably far away and becoming more so. Mad blitzes of hard rain obscured the world and the frothing vaults of wildly multiplying waves walled him in. She called out to him, stuttering his name, her voice driven with terror and grief, and he was propelled away from her in a relentless current. He summoned all the strength of the von Pellier line and all the strength of Levi's eye and all the strength of his love to his lungs and yelled Doris, Doris, Doris. But the thunder dwarfed him, and the tsunami carried him away. He searched for years and never found her, and he wasn't even now able to fix a date that he'd given up. It was just one morning as if he'd turned a page without meaning to. He'd ended up North, somehow, incalculably far from the Micronesian chaos in which his journey had begun, and it occurred to him very simply that he wasn't looking for his wife anymore. It was around this time—which wasn't a good time for Cameron—that Oleg the fisherman, no doubt coughing and weeping, found him and scooped him up. All of that—that wordless chapter with Levi, the progeny he'd never given a second thought to until it was too late, the uncharacteristic ebullience of his verse back then, and the picture of Doris, mirthful, patient, nursing, atop eggs, then to the waves and the storm and the aimless, unspooled yarn of those blank years on the seas, the unburied dead—all of that was epilogue to the beautiful interim of the Sheets and von Pelliers: the splendid days passed on the Island of Meats and Cheeses. "Do you know why they call it a honeymoon?” Cameron asked Eugene. They were still sitting on the beach, only it was night now, and they hadn't exchanged a word for some time. Cameron had traced back in his mind certain passages of his own history, which he supposed Eugene had also done, and now he felt talkative. “How about that,” Eugene said. Cameron here withstood a boisterous litany of disagreement, let it flare briefly and then die on his tongue. A long time ago Gene Street had left his sister. His sister who'd broken a family covenant by marrying below her, his sister who'd had to prostrate herself to be on eye-level with her reckless, gambling groom; she who loved him dearly in spite of herself and who had sacrificed her inheritance and forfeited her rightful place for him had been abandoned the moment an opportunity for celebrity had winked open. Cameron swallowed. He supposed it was possible he'd outlived his native contrariness. Cameron thought on this. He supposed it was possible too that Gene Street had outlived his native flamboyance. “Maybe.” Eugene didn't sound sure. They looked at each other and then, all of a sudden, Cameron and Eugene were in the water, paddling with determination, and Cameron didn't know how or why it had happened, only that he was happy. The moon was climbing and the water was very cold and the song that the waves played lapping against him—for once, for the first time in a long time—was not threnody, but a heated and in fact warming melody…the kind of tune a knight on a precious and important errand would command of his minstrels as he careened through a treacherous wood…just the right music, Cameron thought, for an odyssey. “What's your poem called?” Eugene asked, his voice excited over the water. And Cameron began, and the moon climbed and the stars were in their mouths and together, happily, the two turtles steered into the waves.